VERDICT: Outstanding! The only lovable Drupal WYSIWYG editor . Painless Installation, Great First Impressions, Easy to configure, image Uploading/insertion works out of the box, editor behavior solid and intuitive, and offers good security features. In our last review of WYSIWYG editors, a certain editor won because it met my low expectations. Thanks to the tip from Sanjeev, I found an editor so good its off the charts. 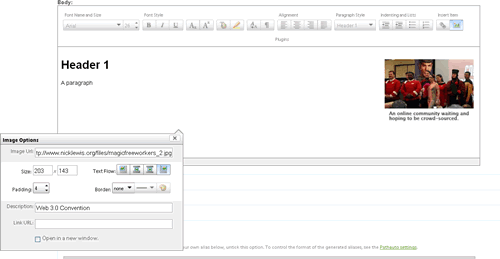 The moment after I installed YUI Editor I found this refreshing WYSIWYG smiling at me.